Diastematomyelia: The hemicords are separated by a bony or cartilaginous medial septum. Spine defects are usually present at the level of the split. Cutaneous stigmata are identified in two-thirds of cases, consisting of hypertrichosis, lipomas, dimples, or hemangiomas. Orthopedic foot deformities are often associated with the condition. 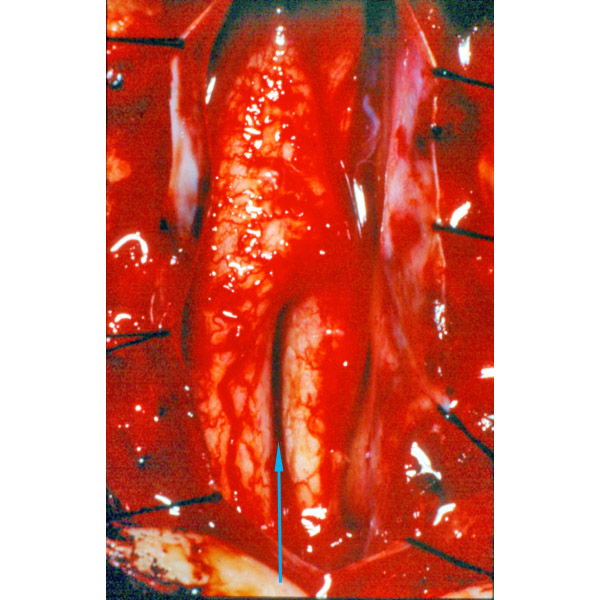 Diastematomyelia: Hemicords are seen in this operative photograph. The arrow points to the location of the fibrous septum. Diplomyelia: The hemicords are separated by a fibrous septum. There are usually no spine abnormalities at the junction of the hemicord, but posterior spinal defects are identified in the lumbosacral region.